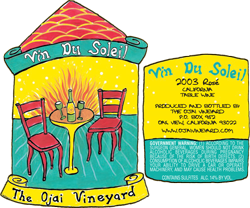 The southern Rhone grape varietals do very well in Santa Barbara County–really too well. The vines tend to be overly productive, and the problem has been too many grapes with too little character. We’re fighting that tendency with careful farming. We actually trim each cluster of grapes in as many as seven places to reduce the crop and increase the sun exposure of each berry. As you can imagine, this is time-consuming and often leaves two-thirds of the crop on the ground. But we get what we want-a small crop of well-exposed fruit that makes intensely flavorful wines. The 2000 red is 85% grenache from Stolpman and Beckman vineyards and 15% syrah from Roll Ranch. It is as huge as any of our single-vineyard syrahs but isn’t heavy at all. Grenache gives the wine a wonderful drinkability. We’re biased of course, but the 2002 blanc is just dynamite. Watch out chardonnay! This is so much more interesting. This year’s wine is a combination of exotic floral aromatics and zesty acidity from viognier grown at Bien Nacido, with the palate-filling heft that Stolpman roussanne delivers. Wow!